The National Front was a far right political party in Switzerland that flourished during the 1930s. At its peak the group had at most 9,000 members, according to the Historical Dictionary of Switzerland, and "may have had a membership of 25,000 or so", according to the Simon Wiesenthal Center. The party began life amongst a number of debating clubs at the University of Zurich, where antisemitism, Swiss nationalism and support for ideas similar to those later adopted in the racial policy of Nazi Germany had become popular. A number of these groups (all of which co-operated in a loose federation) were formally brought together by Robert Tobler in 1930 to form the Neue Front under the leadership of Hans Vonwyl. Initially the Neue Front did not grow far outside the confines of the University but soon the party newspaper, Der Eiserne Besen (The Iron Broom), became widely read and its antisemitic message found an audience. Initially bearing some of the hallmarks of Austrian National Socialism, the National Front, newly founded by Rolf Henne, absorbed the New Front in 1933 and moved to a more orthodox fascism. Emil Sonderegger, a former member of the Swiss General Staff, was a prominent speaker and propagandist of the National Front at this time. The party continued to grow and soon won seats on Zürich council, as well as the support of well-known Swiss writers of the time, such as Jakob Schaffner. They did not come out completely in favour of any regime and instead sought to unite German, French and Italian speakers in a common Swiss identity (they maintained links with a minor Romansh far right group, although the National Front did not campaign amongst the Romansh). Nonetheless their support was more or less wholly comfined to German-speakers, with other groups picking up the support of fascist-inclined voters in the other linguistic groups (Union Nationale for the French and Lega Nazionale Ticinese for Italians). The party's main support base was in Schaffhausen where it gained seats in the local council, as well as electing a single member of the National Assembly in 1935. The seat was held by Robert Tobler. Henne had lost the leadership of the group to the more moderate Robert Tobler in 1938 and his followers left to form what would eventually emerge as the National Movement of Switzerland. Tobler's moderation did not avert the suspicions of the Swiss government however and In 1940 the party was formally dissolved after Tobler was briefly imprisoned for espionage. Tobler would reform the group as Eidgenössiche Sammlung soon afterwards, although this too was gone by 1943. ↑ Nationale Front, in the Historical Dictionary of Switzerland (in German). 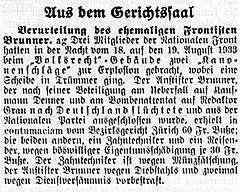 ↑ Neue Front, in the Historical Dictionary of Switzerland (in German).